Throughout the world, people are discovering the need for a new kind of heroism. The world, which has seen and sometimes even admired the heroism of violence, must now learn the kind of heroism that has nothing to do with swords, guns, and bombs. It is the heroism of the person in an extended state of dread. He knows that any journey may be his last, that danger lurks everywhere. Yet he does not break down: He conquers his will, is slow to anger, and maintains his focus. This heroism is the ability to be in a state of anxiety and fear, while still living and building and continuing to fight a war in which there are no immediate prospects of victory. This is a life of quiet heroism, of ongoing self-sacrifice. This kind of heroism lacks the grandeur that attends the conqueror of cities. Conquerors are honored with triumphal processions, but no one mounts a celebration of a person who conquers his will. Besides, tomorrow, and every day after, he will have to do it again and again. 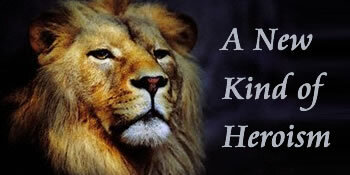 The hero we need today, then, is not the one described in Pirkei Avot (5:20) as "heroic as a lion." In fact, the lion is a very lazy animal that spends most of its time doing absolutely nothing. It does, however, have the ability to reach high speeds in a fraction of a second and harness tremendous force in order to accomplish something quick and spectacular. The "heroic lion" kind of hero has great powers, but they are neither constant nor stable; rather, they are revealed all at once, in one sudden and dramatic outburst. The hero whose heroism is not discernible is the greater hero. It is the storeowner who wakes up in the morning and opens her shop, even though there was a terrorist attack next door the day before. It is the man who walks with his backpack on his shoulder, and continues walking, even after he has been attacked; the person whose house is destroyed, yet he rebuilds; the individual whose plants are uprooted, yet he replants; the woman whose children are murdered, yet she gives birth once again. This heroism is not suitable for movies or the theater. Nor is it the kind of heroism that is limited to the prominent and the powerful; it is within reach, also, of the simple and the small. It is the heroism of "when I fall, I shall arise" (Micah 7:8), of "a just man falls seven times, and rises up again" (Proverbs 24:16). The just man falls seven times because he is not an angel, only a just man; angels fall only once, if ever. A just man falls and falls and falls again, and there is no guarantee that the seventh fall will be followed by an end to his trials and tribulations and obstacles. He may even fall 77 times, yet he is commanded "rise up again, rise up again." This is precisely the kind of heroism we need now - the heroism to continue in a situation where no promises are made, and in which we know nothing about what is going to happen. It is the heroism of falling and rising up, and falling and rising up again - the heroism of "in quietness and in confidence shall be your strength" (Isaiah 30:15). I hope that we shall all find the strength for this kind of heroism, so that we can be "as the sun when it goes forth in its might" (Judges 5:31) - able to keep awakening with quiet constancy, while unfailingly emitting light and warmth.